Each morning when I am getting ready for work, it takes me the longest amount of time to decide what I am going to wear that day. Like many people, I spend 15+ minutes just standing in my closet just staring at all my clothes. 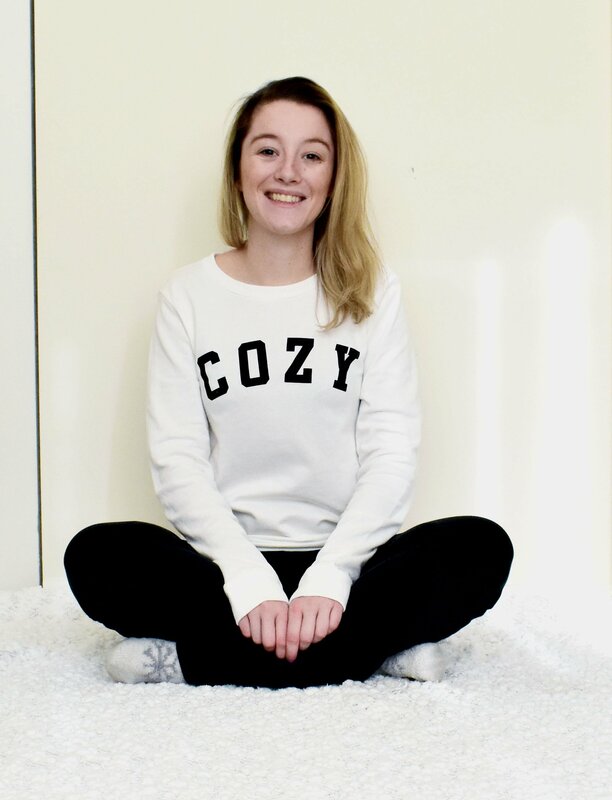 I have always been interested in having a capsule wardrobe but to be honest, I thought that it would be restricting and that I would have a boring wardrobe. Then I began watching all of these fashion and minimalism documentaries that opened my eyes to how wasteful the fashion industry is. I didn’t want to just keep buying new clothing because I was bored with what I already owned. So I turned to the internet for advice on what I could do – that is when I came across Project 333 and capsule wardrobes. The idea of cleaning out my closet and just having 30 items to choose from was very appealing to me. I wouldn’t have to spend a lot of time staring at my clothes trying to figure out what I can wear and what kind of jacket and shoes I should wear with it. In all my research on online, it became clear to me that I needed to pick a color scheme so that all of my clothing would match and would be able to be matched back to many different items. I chose three very simple colors black, white, and tan that go with everything. And then since it is summer and that is a time for lighter colors, I decided on the fun colors blush pink and sky blue. Once I decided on what colors I wanted to wear, it was easy to go through and pick out all the items that were those colors. I started by taking EVERYTHING out of my closet. I put all of my other seasonal clothing and shoes into bins so that I could just focus on my summer clothing. From there I sorted through colors and sizes, what I wore all the time and what I didn’t wear at all. I had a donate/consign pile for clothing that didn’t want anymore, and then I was left with about 75 items that I had to choose from. From there I narrowed the items down by how pair-able the pieces were and how versatile they could be. I ended up with a 40 piece capsule wardrobe and I am pretty proud of myself for narrowing it down that much! Decided on what tops to have in my capsule wardrobe was the hardest part and it was also the last category of clothing that I decided on. In the end, I picked out 15 tops that I thought would be the most versatile and what could be paired with the most items. I have the same Philosophy chiffon tank top in 4 different colors that I wear all the time for many different occasions so naturally, I picked those to be included. Then I picked out a bunch of basic tops like stripes and polka dots tees and then a few basic buttoned-up long sleeve shirts. Then I had 5 more tops that I could add in, so I chose to go with more stylish tops that weren’t necessarily basics but more trendy summer items that I could wear when I wanted to be more fashionable. Pants were a lot easier to pick out because I really only wear a couple of shorts and jeans anyway. I decided on 7 pairs of pants – 4 shorts, 3 jeans, and 1 work trouser. I stuck with very neutral colors like black, white, dark denim, and light denim. Since we are allowed to wear jeans to work, I only picked out one work pant in a grey color. I don’t wear a lot of dresses and skirts all that often but I took this capsule wardrobe as an opportunity to wear them more. I decided on 2 dresses, a t-shirt dress, and a tank style dress. 1 maxi shirt that I could wear around my waist or belt up high around my stomach for a boho look. Then I also choose 1 jumpsuit that I can be easily thrown on and can be paired with things or can be an entire outfit on its own. Since I am always cold and could not live without a cardigan or jacket on me, I had to make room in my capsule wardrobe for them. I decided on 1 dark wash jean jacket that can be worn with everything. Then I picked out 3 long cardigans that also pair nicely with all my items. These 4 pieces I can just grab as I am running out the door and I don’t have to worry about if they will match or not because of all the neutral colors. The easiest part of this capsule wardrobe was picking out the shoes. I already try to buy shoes in neutral colors that can be worn with many outfits. I picked out 8 shoes – 1 loafer, 2 mules, 1 sneaker, and 4 sandals. All of which are either brown, tan, or white. Then I added 2 purses to be included in all of this. I monogram bag that is black, white, and pink – and 1 brown circle bag that I have with me all the time. 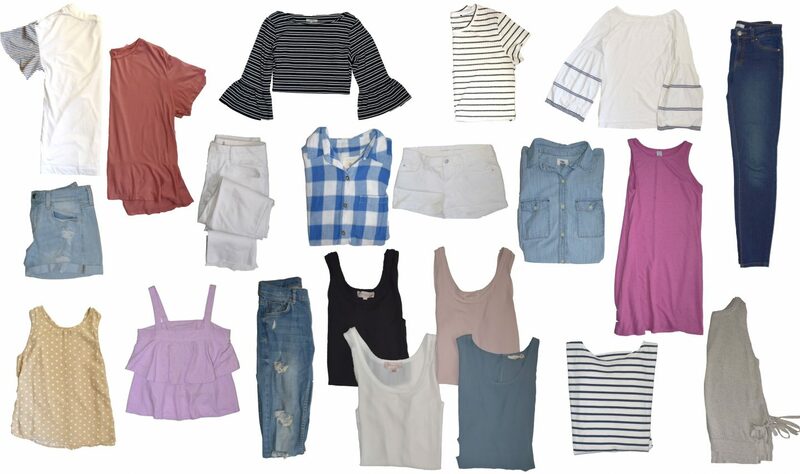 40 items in total is what I choose to wear for the months of July, August, and September. So far it is working extremely well. I love waking up in the morning, going into my closet and seeing what I already wore and what I have left to choose from. I can make around 50 different outfits so I never have to repeat an outfit in the same month! It’s actually exciting how many different outfits I can make just from 30 clothing pieces. 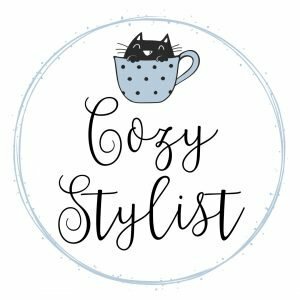 I am now planning out all the items that I want to include in my Fall capsule wardrobe and picking out the color scheme for October, November, and December. Have you ever tried a capsule wardrobe? I really would like to try this. A capsule wardrobe sounds so simple and practical. The next time I get in the mood to clean my closet, I am going to pick items that can be mixed and matched into many different outfits. Yes having a capsule wardrobe was the best thing I ever did! Wow, this is amazing. It scares me but also excites me because I spend waaaaay to much time just staring at my clothes, ultimately deciding I have nothing to wear LOL. I might just have to take this challenge up and create a winter capsule wardrobe! Me too girl that is why I decided to do it! This way I can just look in my closet to see what I have or haven’t worn already. All the colors go together so I don’t have to worry about if the outfit will match and I only have a couple pair of shoes to choose from. So the process of getting dressed in the morning is now super easy! Having a capsule wardrobe saved me a lot of time in the morning when I was getting ready. It really is a great idea!